UnderCoverProject: RacepoD, The Place to Be Every Friday-Starting from June 17th !!! 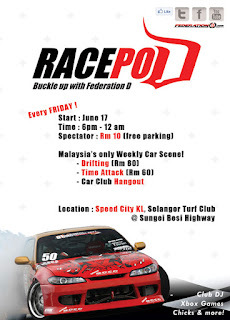 RacepoD, The Place to Be Every Friday-Starting from June 17th !!! Do you find yourself constantly looking out for abandoned car parks as your next location to experiment your new drifting skills? I’m sure you found a few hotspots around your place by now, but yeah – plus a few times getting busted by the cops . We feel you. Cuz we’re drifters too! Look no further, the next hotspot to be (where the only chase you’ll get is only during tandem) is none other than in RacepoD , Speed City KL! Every Friday starting in June! Sounds too good to be true? Well, we are gonna burn a whole load of tyres and smoke up SpeedCity’s drift track to show you that this ain’t a joke. Corporates! Interested in having your brand, or your own booth there, or show your TVC ad?